Choose from over 900 colors! Fibre Glast offers premium polyester gel coat that can be perfectly matched every time. Whether you select an RAL favorite, or choose one of 730 custom Instint® colors, all of these gel coats feature high gloss, UV protection, and blister resistance with excellent adhesive properties. These gel coats are also easy to use and easy to repair. Custom colors are available in a one-quart can for $62.95, a one-gallon can for $143.95 or a five-gallon pail for $529.95. 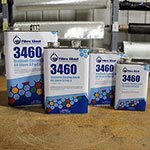 RAL 9001 and RAL 9010 are available in gallon and five-gallon sizes only. Please note, one gallon of gel coat will cover approximately 40-80 sq feet. MEKP hardener is required for each color and is sold separately. NOTE: The gel coat colors displayed on this website only use a three-color display (RGB), and will not reflect the exact color of the final gel coat. 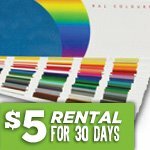 For the most accurate representation of the gel coat colors that we produce, we recommend you rent or purchase the Instint® Color Book and the RAL Color Book. 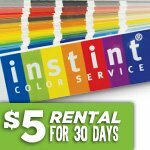 To rent a color book or purchase a gel coat color from the Instint® Color Book, please call 1.800.838.8984. You can purchase the RAL Color Gel Coat you want right here on our website. For Instint® Colors or if you have any questions about your color gel coat order, you can call 1.800.838.8984. Color Gel Coat 'No Return' Policy - All Color Gel Coat is made-to-order; therefore, cannot be returned to inventory. All sales of Color Gel Coat are final.